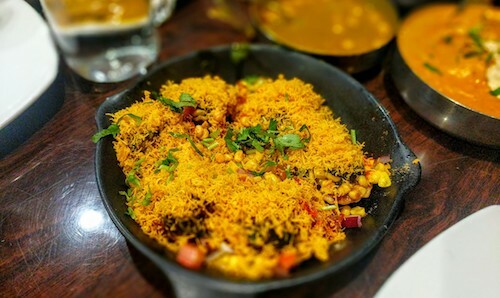 Kailash Parbat expanded its empire to New York City about four years ago, bringing its famous chaats and Sindhi cuisine. 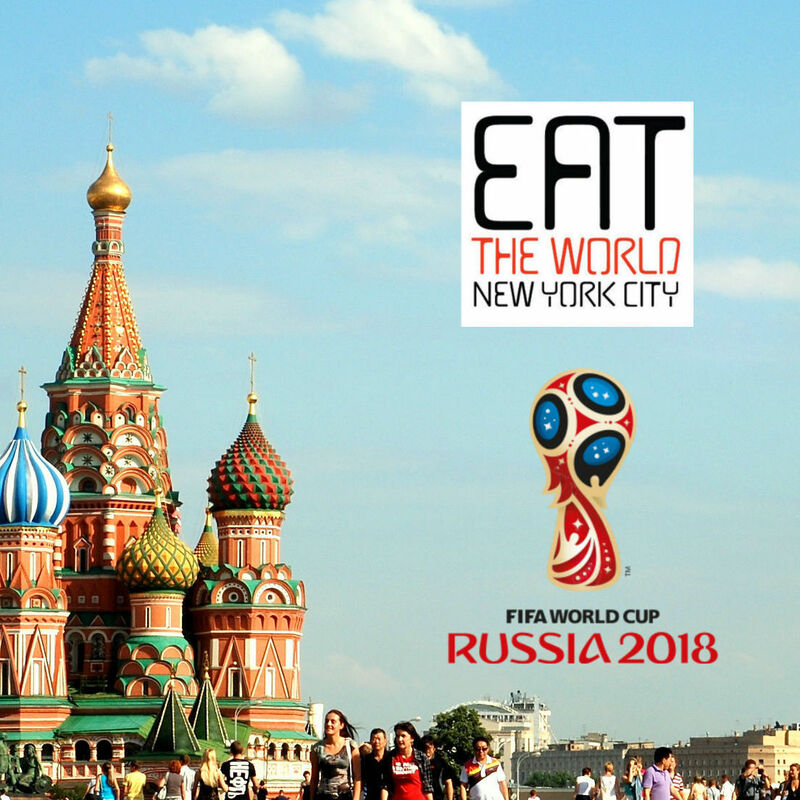 These are the two things that immediately jump out from what might appear like another vegetarian Indian restaurant on Lexington Avenue in Kips Bay. 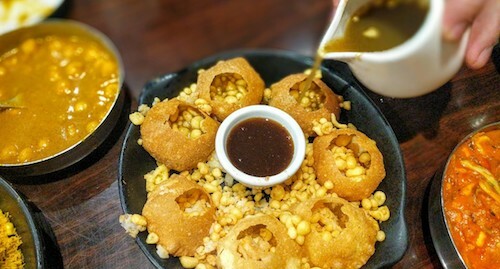 Their chaat bar is heavily promoted from outside, and what catches your eye first when entering, but the small portion of the menu dedicated to Sindhi foods is as much or more interesting. More on that later. 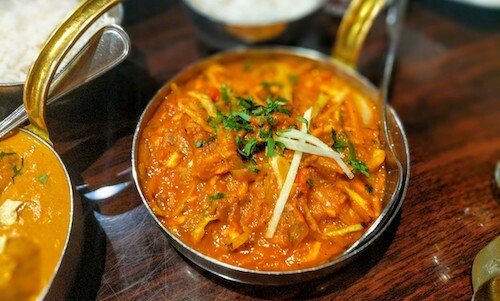 The empire that slowly expanded throughout India from Mumbai has made leaps as far as Singapore and London, and eventually New York City and now has a location on Oak Tree Road in Iselin, New Jersey. That first location in Mumbai, still a landmark in its own right, started in 1952, shortly after its founders were forced from Sindh in present day Pakistan after partition. As with many chains that make the jump internationally, things inside the restaurant are spruced up. Neon lights sparkle off bottles of alcohol and colorful photos adorn the walls. 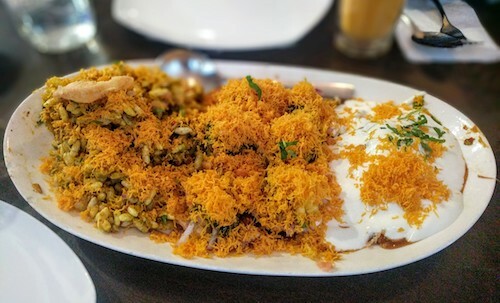 Take the hint and order some of their chaat options, starting with the KP chaat platter ($15.99, above), which combines three types and gives the maximum flavor and texture on one plate. 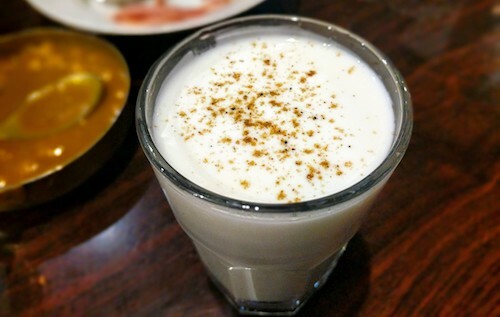 Lassis are good here like the salty lassi ($5.99) below. The mango lassis ($6.99, not shown) use real Indian mangoes, making the price well worth it. 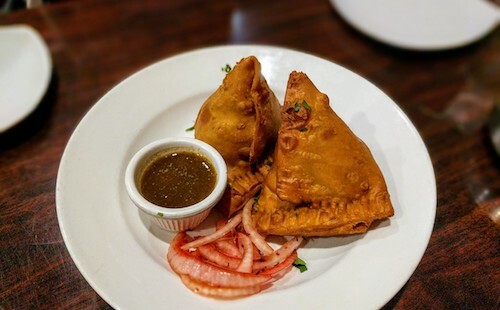 After a bite or two of the Punjabi samosas ($11.99, below), you start to feel like most of the food here is of high quality. 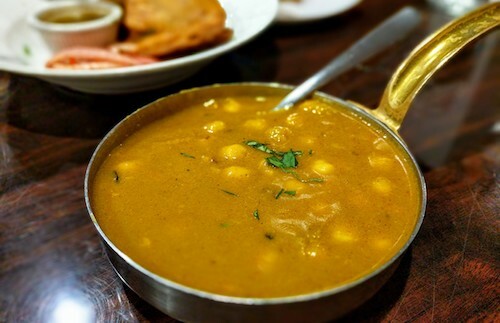 The vegetable and potato interior is full of spice, while the accompanying chickpea curry offers a sharp tang. Don't be shy to order more from the chaat bar if you come here with a decent group. The sev batata puri ($7.99, below) is also full of numerous enjoyable tastes and textures. Usually something you eat from a cart on the street, the paani puri ($7.99, below) is excellent. They prepare the crunchy bowls and serve the tamarind spiced water on the side to pour as you are ready. This almost makes it just as fun as getting these one by one by a good vendor. Leave room on your plates and in your stomachs to enjoy the Sindhi cuisine that is found on the menu, like the special Sindhi chapati ($3/each, below top left), which complements the other dishes so well in addition to rice. 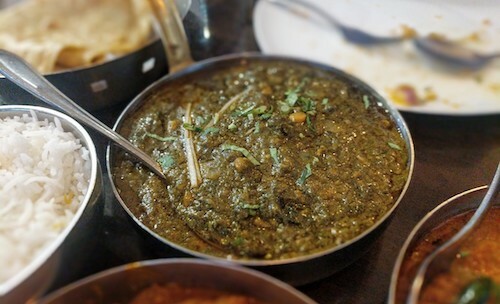 Sindhi curry ($14.99, below) is described on the menu as "a must for every Sindhi household." The vegetables float in a gravy of gram flour that also takes on the tanginess of tamarind. Of all the dishes, this is the one that distinguished itself most from dishes you might try in other northern regions of India. This is a special meal eaten mostly on Sundays when families get together, but available any day here. It is cooked in a unique large round aluminum vessel that is perfect for slow cooking. 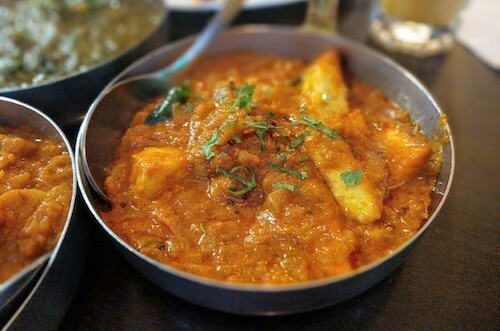 Seyal paneer ($15.50, below) uses a special cottage cheese preparation from the "heartland of Sindh." 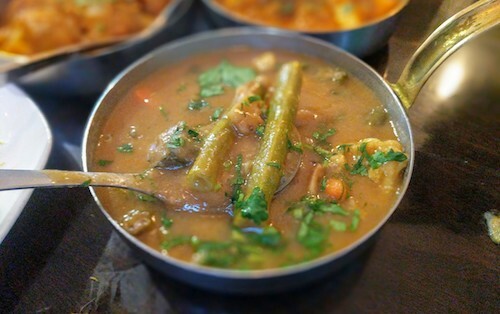 Judging by the reactions of the table, sai bhaji ($14.99, below) was probably the most popular dish. Spinach and lentils form the base. 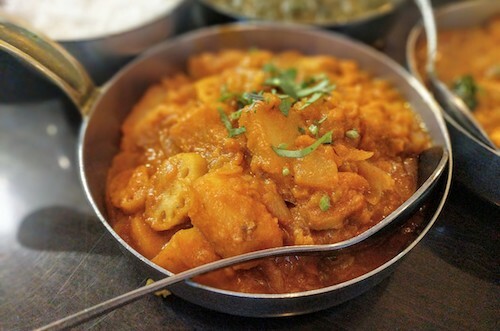 Bhugal bhee aloo ($14.99, below) is a tomato-based masala with potatoes and lotus. 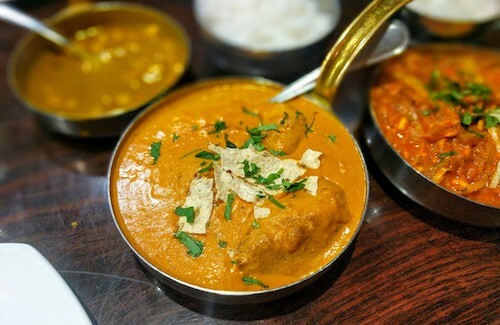 After three large meals here, it is safe to say that Kailash Parbat is one of Lexington Avenue's best. Ingredients and cooking techniques are important and it shows.